Roofline services cover things such as guttering, soffits, fascias and cladding. We can also provide roof light services for lanterns and skylights. Having an efficient roofline system on your property is vital for overall property health and minimising water damage, damp and mould problems. 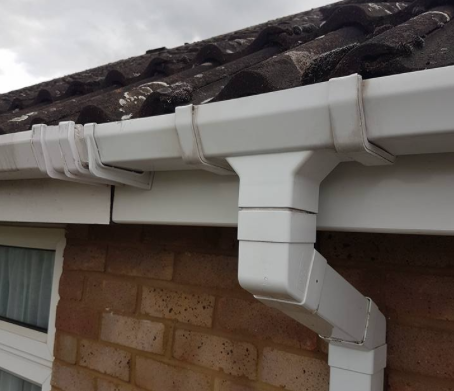 Guttering provides the means of transporting rainwater away from your property, which is extremely important as a lack of efficient guttering causes blockages, dirt and debris which creates structural damage. Our team provide all aspects of guttering which is weather resistant, long lasting and affordable. Having professionally installed fascias, soffits, downpipes and cladding also helps to protect and improve your property's overall appearance which helps improve functionality, structural soundness and value. What Types of Roofline Services Can We Provide? Guttering - having an efficient guttering system is vital on both residential and commercial buildings and ensures rainwater to be carried away from the property. Fascias - the long straight boards that go along the lower edge of your roof. Soffits - are important part of roofline systems because they protect and enclose the underside of the roof edge whilst still allowing airflow into the inner part of the roof. Cladding - can be added over the top of any existing brickwork or material. It can be positioned to help improve the 'first impression' of your property whilst giving adequate protection. Easy to clean and install. Roof Lights - alongside our roofline services, we provide clients with an extensive range of roof lights. From lanterns to skylights we have you covered. If you require our roof light or roofline services in Croydon or South London, request a 100% free roofing quote or call our team directly on 07984 419787.